Done by Mike Evans using several pictures from the Graceland archives. Featuring approx. 600 images over the same amount of pages, it spans through the whole of Elvis' life and career. 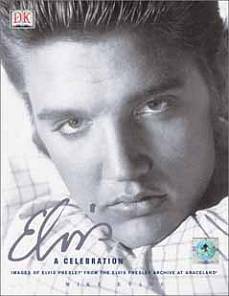 Some of the pictures are very familiar, but there are also a portion of fairly "new" images of Elvis in this book. Since this year marks the 25th anniversary of Elvis' death, the market has been swamped with books. This photo book is one of the best. We're talking 600 pages filled with magnificent pictures of our hero, most of them in full-page size. The captions are informative and well-written. Many of the shots were new to this reviewer's eyes, so I think I can guarantee you an exciting reading experience. The book stands testament to the claim that Elvis was the world's most photographed human being. It's all here: Teenage Elvis before he cut his first record, on tour, in different studios, on vacation, during film shootings, at Graceland and so on. Fans that are into the 70's will not be disappointed either; at the end you'll find several beautiful pics of Elvis in various jump suits. There are numerous highlights, but my favorites would have to be the unique color shots of Elvis on maneuver in 1959, we even get a look at Elvis shaving in the woods! And I never could have guessed that such a vast amount of photos were taken at Goethestrasse*, where Elvis often poses with a guitar. Many times he has recording equipment or a grammophone in his near vicinity. My only complaint is that there are a few blurred pictures in the chapter/section "Relaxing 1967-73" (although pictures actually date from 1964 to 1976!). The book captures every significant moment in Elvis' career, although I think it's a bit odd that they didn't include a single picture from Elvis' concert in Memphis 1961. * Elvis' home in Germany. There are very few mistakes in the book, the most flagrant being the assertion that Elvis' September tour of 1970 was seen by "over a million spectators", which obviously is completely wrong. Also, keeping in mind the ambition and knowledge of the author, it's a bit strange that the caption on page 85 does not mention that the man standing next to Elvis is Dewey Phillips, the first disc jockey ever to play an Elvis record. And finally, I think it's almost horrendous of Mr. Evans to state that Colonel Parker was a "long-term friend of Elvis". We know better. But don't let that bring you down ("it's only castles burning..."). Buy this one! Sure, it's expensive, but definitely worth the money. On a scale from 1 to 5, I give it a 5.